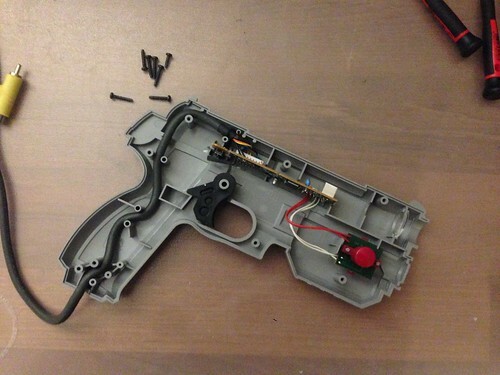 As you can see the light gun uses a lens to focus the light on the photodiode. It uses a 7071 to separate the CSYNC signal out of the composite video signal. The processor (NAMCO103P) looks like especially designed for the NPC-103. Here's the schematic of the circuit i made out of my observations and measurements. I'm still missing the values of the capacitors, it will require to unsolder them from the board to be able to measure it out of circuit. I am not really sure if PS1 is a photodiode or a phototransistor. Also, a lot of pins are connected to GND, i have no clue about which one has continuity with it, it will also require to unsolder it from the board to be able to check it out. How the circuit works ? The 7071 separates the CSYNC signal from the composite video signal and forwards it to the microprocessor. SENSE is low when light is detected. The microprocessor is also handling buttons (A, B & T). A and B lines are pulled up by a 22KΩ resistor, when pressed the line is pulled low. You will note that T doesn't have a pull-up resistor, the reason is that T line is already pulled up by the microprocessor (internal pull-up resistor). Three pins of the microprocessor are not connected or only to a test point (9, 17 and 30). Pin 9 is connected to a test point and a 1KHz square signal is generated. 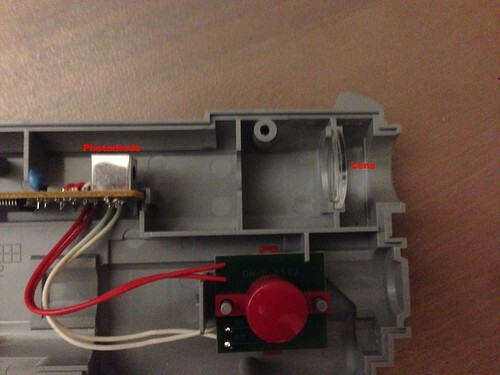 Pin 17 is not connected and have continuity with VCC. 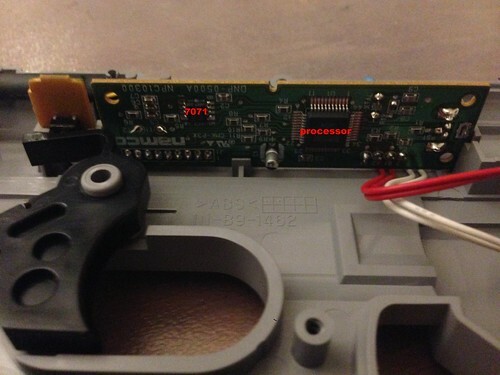 Last part the microprocessor handles is the communication with the playstation.